After the war ended, U.S. troops were demobilized and rapidly sent home. One unanticipated and unwanted effect of their return was the emergence of a new strain of influenza that medical professionals had never before encountered. Within months of the war’s end, over twenty million Americans fell ill from the flu. 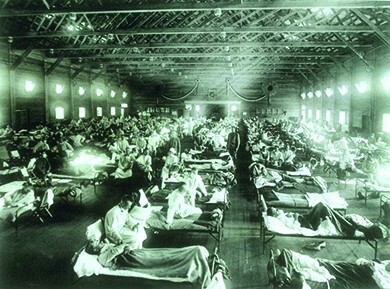 Eventually, 675,000 Americans died before the disease mysteriously ran its course in the spring of 1919. Worldwide, recent estimates suggest that 500 million people suffered from this flu strain, with as many as fifty million people dying. Throughout the United States, from the fall of 1918 to the spring of 1919, fear of the flu gripped the country. Americans avoided public gatherings, children wore surgical masks to school, and undertakers ran out of coffins and burial plots in cemeteries. Hysteria grew as well, and instead of welcoming soldiers home with a postwar celebration, people hunkered down and hoped to avoid contagion. 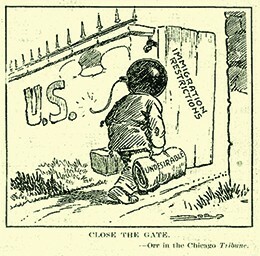 In addition to labor clashes, race riots shattered the peace at the home front. The sporadic race riots that had begun during the Great Migration only grew in postwar America. White soldiers returned home to find black workers in their former jobs and neighborhoods, and were committed to restoring their position of white supremacy. Black soldiers returned home with a renewed sense of justice and strength, and were determined to assert their rights as men and as citizens. Meanwhile, southern lynchings continued to escalate, with white mobs burning African Americans at the stake. During the “Red Summer” of 1919, northern cities recorded twenty-five bloody race riots that killed over 250 people. Among these was the Chicago Race Riot of 1919, where a white mob stoned a young black boy to death because he swam too close to the “white beach” on Lake Michigan. Police at the scene did not arrest the perpetrator who threw the rock. This crime prompted a week-long riot that left twenty-three blacks and fifteen whites dead, as well as millions of dollars’ worth of damage to the city. Riots in Tulsa, Oklahoma, in 1921, turned out even more deadly, with estimates of black fatalities ranging from fifty to three hundred. Americans thus entered the new decade with a profound sense of disillusionment over the prospects of peaceful race relations. While illness, economic hardship, and racial tensions all came from within, another destabilizing factor arrived from overseas. As revolutionary rhetoric emanating from Bolshevik Russia intensified in 1918 and 1919, a Red Scare erupted in the United States over fear that Communist infiltrators sought to overthrow the American government as part of an international revolution. When investigators uncovered a collection of thirty-six letter bombs at a New York City post office, with recipients that included several federal, state, and local public officials, as well as industrial leaders such as John D. Rockefeller, fears grew significantly. And when eight additional bombs actually exploded simultaneously on June 2, 1919, including one that destroyed the entrance to U.S. attorney general A. Mitchell Palmer’s house in Washington, the country was convinced that all radicals, no matter what ilk, were to blame. 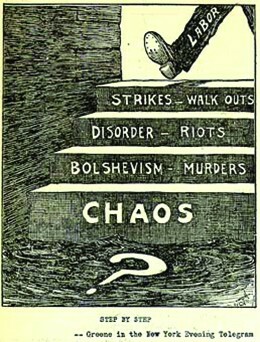 Socialists, Communists, members of the Industrial Workers of the World (Wobblies), and anarchists: They were all threats to be taken down.